With most people focused on releases from the other members of the Girard-Perregaux watch stable every year, it’s easy to overlook the less headline-grabbing but nonetheless popular, Cat’s Eye, collection. This year the brand launched three new additions to the line – the Majestic, the Celestial, and the Tourbillon. What they have in common is an aventurine dial. There is currently a Cat’s Eye Day and Night model with an aventurine dial as well. The Majestic in a 40mm x 34.7mm pink gold case with sixty brilliant-cut diamonds set on the bezel. If that’s not enough for you, there are a further twenty-four brilliant-cut diamonds on the dial’s markers atop the aventurine dial. Inside is the automatic Calibre GP03300-0121 with a gold oscillating weight decorated with a Girard-Perregaux ‘tapestry’ motif. It has a power reserve of forty-six hours. The 2019 blue theme continues from the dial to the alligator strap, which comes with a metal-matching pink gold clasp. The second of the new trio is the Cat’s Eye Celestial. In a smaller 35mm x 30.4mm pink gold case and the aventurine dial dominated by a moon phase decoration that has a mother-of-pearl mooon and a sprinkling of non-astronomical depictions of stars. There are thirty-three brilliant-cut diamonds on the dial and sixty-two brilliant-cut diamonds on the bezel. Inside is the automatic Calibre GP03300-0125, with forty-six hours of power reserve, and it too comes on a dark blue alligator strap with a pink gold clasp. Last is the Cat’s Eye Tourbillon. 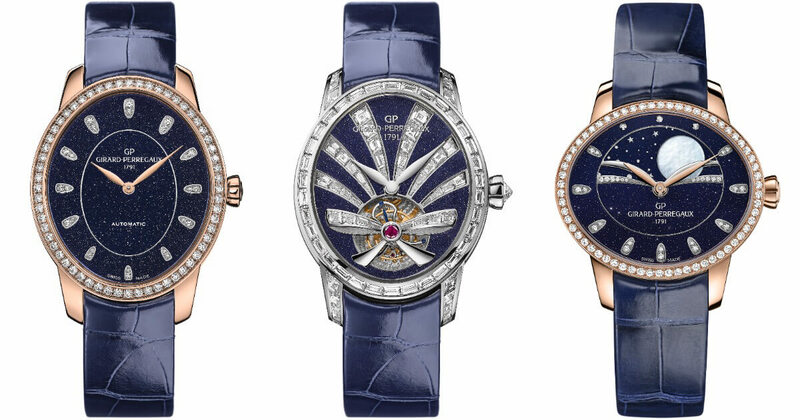 Girard-Prregaux do currently have the Cat’s Eye with a tourbillon with a golden bridge, and a three gold bridges variant. This new one comes in a 32mm x 27mm white gold case, the bezel is set with fifty-four baguette-cut diamonds, with a further rose-cut diamond in the crown, and thirty-six baguette-cut diamonds on the aventurine dial that are meant to be an interpretation of shooting stars. The shooting stars abstraction looks more like gift wrapping (with a bow) to me, but diamonds are in the eye of the beholder. The tourbillon of the name is at 6 o’clock, as is a blued small seconds (that is perhaps a bit lost amidst the shine). and it is part of the manaul-wind Calibre GP09700-0015 that powers the watch. It beats at 21,600VPH and has seventy hours of power reserve. Similar to the previous two new models, this one also comes on a dark blue alligator strap, but its white gold folding clasp has seven baguette-cut diamonds.